Location: Park Hotel Troyan is situated 500 metres from the centre of Troyan, up on a hill in the "Kapincho" city park. Accommodation: Park Hotel Troyan offers 33 comfortable double rooms with balconies, 10 standard double rooms with no balconies, 2 studios, three apartments and four small villa apartments next to the hotel building. All rooms have satellite TV with more than 40 international channels, hairdryer, direct telephone line, mini-bar and Internet. 24-hour room service, safe deposit boxes, laundry and dry cleaning available. 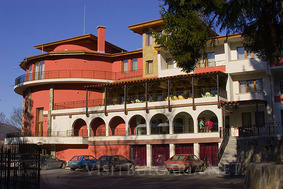 Hotel Facilities: Park Hotel Troyan has a restaurant with 100 persons seating capacity and a lobby bar/cigars bar. The restaurant serves traditional Bulgarian, Indian, Arabic and Italian cuisine. At guests disposal there are spa & relax centre with indoor swimming pool with warm water, sauna, steam bath, solarium, gym, jacuzzi, massage halls and spa capsule for different spa procedures. For the business travellers Park Hotel Troyan offers conference hall Arcadia, which has 100 persons seating capacity and two other smaller halls wioth 12 and 10 persons seating capacity. The hotel disposes of a parking lot and elevator.